They were dead broke, but they had the answers! He was a history teacher. She was a children's author. Together, Bernard and Claire Boiko of Queens, NY were the parents of five children. A pair of curiously relatable outsiders, they captured American hearts�and saved their family while they were at it. They appeared on TV game shows 28 times over 37 years. From Tic-Tac-Dough in 1956 to Now You See It, Concentration, Jeopardy!, The Match Game, To Tell the Truth�and right up to Trivial Pursuit in 1993�the Boiko's competed on national television and quite possibly hold the record for individual TV game show appearances by husband and wife. Narrated by their daughter, Patricia, Game Show Dynamos is an all-American story of family, commitment, challenges, and a life-long run at the American dream. 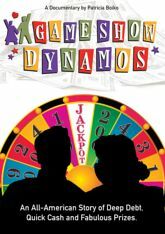 Game Show Dynamos will lift your spirits and break your hearts in one lightning round of pure entertainment.